Belke is a Turkmen pasta dish that is usually just topped with yogurt garlic sauce so if you want a meatless dish, you can skip out on the meat topping, or try belke with spinach. 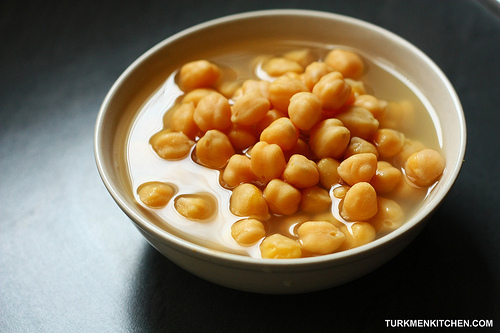 Soak the chickpeas in cold water overnight. Then place them in a saucepan filled with water and bring to a boil. Simmer until they are tender, then drain and set aside. Cut the meat into cubes and season with salt, black and red pepper. Heat the oil in a pan and stir-fry the meat cubes for a few seconds, then cover and cook over medium heat. When the meat begins to get tender, add the chopped onion, garlic, bell pepper, tomatoes, and cook, stirring regularly. 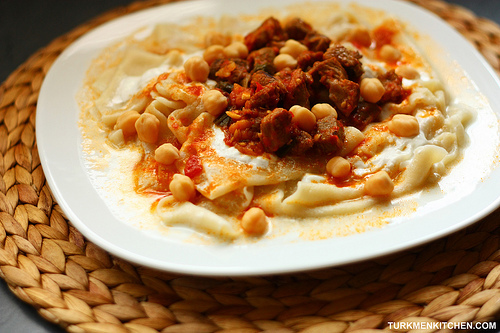 When the vegetables are tender, add the chickpeas and turn off the heat. Bring a large pot filled with salted water to a boil. Add the pasta and cook for 8-10 minutes. To prepare the sauce, grate the garlic clove over the yogurt and stir in the ground red pepper. To serve, spread some of the yogurt sauce over a serving dish, place the drained pasta in the dish, stir in the rest of the sauce and add the warmed meat topping.